It’s an institution for music lovers. Every Tuesday evening at the Prom Music Bar in Gloucester Road to find out who is a smartypants and who turns out to be pants in the music recognition stakes. 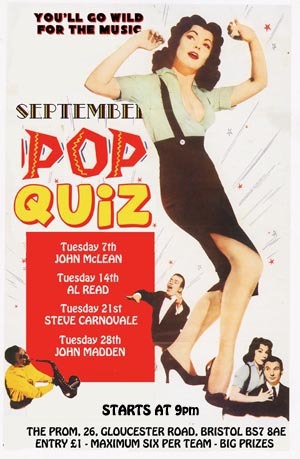 Main man from the Granary days Al Read presents the quiz once a month and Al would love to see you at the Prom. Al and Ed also make a point of being there virtually every Tuesday and will make always you welcome.